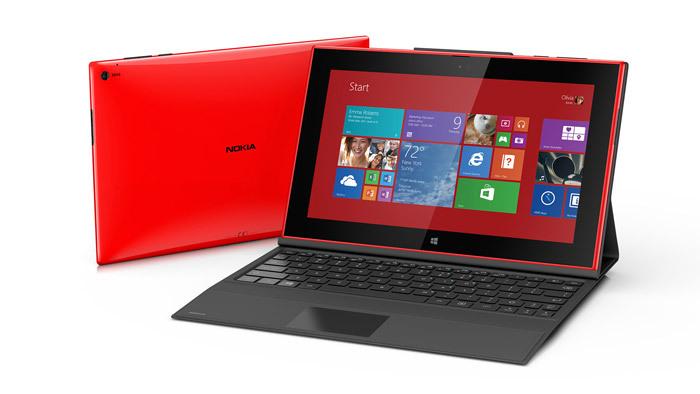 Nokia has officially introduced its first tablet – the Lumia 2520. Offering powerful hardware the new company product will be available in several colors that include red, black, white and bluish-green. The Lumia 2520 is based on the powerful Qualcomm Snapdragon 800 processor with four cores that run at 2.2 GHz. In addition the device has Adreno 330 graphics, support for LTE, a 10.1-inch display at Full HD resolution (1920 x 1080 pixels), Gorilla Glass 2 protection, 2 GB of RAM, 32 GB of internal storage, a microSD card slot, Wi-Fi, micro-HDMI and micro-USB ports, a front 2 MP camera, a rear 6.7 MP camera, Carl Zeiss optics, a 8000 mAh battery and HD video shooting at 60 FPS. The Nokia Lumia 2520 tablet runs Windows RT 8.1 and sells for USD 499. For USD 149 more you can get a dock with a keyboard that turns the tablet into a notebook. The dock also adds two USB ports and 5 hours of battery life.